In Stardate year 2233, Starfleet's Federation starship the USS Kelvin reported that it was investigating a huge lightning storm in space, 75,000 miles from Klingon space. Suddenly, a massive Romulan spaceship, the Narada, emerged from the maw of a black hole storm, and opened fire on the Kelvin with torpedoes, inflicting extensive damage (shields appeared ineffective), knocking out the warp drive, and causing many confirmed casualties. Shuttles were prepared for evacuation. The Narada's first officer, Ayel (Clifton Collins, Jr.) commanded that the Kelvin's Captain Richard Robau (Faran Tahir) be transported via shuttlecraft to their ship to negotiate a cease-fire. Lieut. George Kirk, Sr. (Chris Hemsworth) was made acting captain and told to evacuate his ship in 15 minutes, while Robau was questioned by Ayel and the Romulan Captain Nero (Eric Bana). When asked about the location of Vulcan Ambassador Spock (Leonard Nimoy) and the year, Robau claimed he was unfamiliar with him, causing Nero to murder Robau in a rage. Monitoring Robau's vital signs, the USS Kelvin crew realized Robau had been terminated and that their ship was again being attacked. Acting Captain Kirk ordered a complete evacuation from his imperiled ship, including his about-to-give-birth wife Winona Kirk who was directed to Medical Shuttle 37. When the autopilot system was destroyed and only manual operation was possible, Kirk steered the USS Kelvin directly into the Narada, and as he heard the birth of his son (who was named James, after his wife's father), he sacrificially collided with and incapacitated the Narada, allowing the escape pods and shuttlecraft to escape. In Iowa (Earth), about ten years later, young James T. Kirk (Jimmy Bennett) disobediently raced an antique Corvette convertible through cornfields, where he was accosted by a flying motorcycle officer. He escaped death by jumping from the car (it crashed over a cliff edge into a quarry canyon) and holding onto the edge. At about the same time on the planet Vulcan, brilliant young pointy-eared student Spock (Jacob Kogan) was bullied about his mixed parentage - his father was accused of being a traitor for marrying a "human whore." 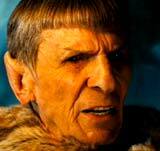 Spock was later warned by his father Sarek (Ben Cross) for beating up one of the other older Vulcan boys in self-defense when he lost emotional self-control, and was told: "You are fully capable of deciding your own destiny. The question you face is, which path will you choose?" When he grew older, Spock (Zachary Quinto) spoke to his mother Amanda Grayson (Winona Ryder) about his upcoming dilemma - whether to participate in the emotion-purging Vulcan ritual of Kolinahr. She assured him that she would be proud of him whatever he decided. Later, before a Vulcan committee or Council of Ministers, it was revealed that Spock had applied to Starfleet Academy (San Francisco), and he rebelliously declined their offer of acceptance into the Vulcan Science Academy, but left them with the grateful wish: "Live long and prosper." Back in Iowa at the local Shipyard Bar, 22 year-old drunken James T. Kirk (Chris Pine) attempted unsuccessfully to flirt with Uhura (Zoe Saldana), an expert in alien linguistics, and learn her first name (Nyota), and ended up in a fight with other Starfleet recruits. After being beaten up, "genius-level" Kirk was challenged by Captain Christopher Pike (Bruce Greenwood) (who had researched the USS Kelvin disaster for his dissertation) because he was "meant for something better, something special" - to enlist in Starfleet. He could be an officer in 4 years and have his own ship in 8 years, and further fulfill what his heroic father did in 12 minutes of command (save 800 lives): "I dare you to do better." Although Kirk rejected the idea of joining up, he was at the Riverside Shipyard shuttle for new recruits early the next morning, joining Uhura and the cadets he had fought in the bar. His nervous seatmate, fearful of flying was newly-divorced Dr. Leonard "Bones" McCoy (Karl Urban). Misfit cadet Kirk boasted that for his third try at the unbeatable Kobayashi Maru test (devised by programmer Spock over four years) at Starfleet Academy, he would foil the test. Encountering Uhura once again, he learned from her that she had picked up an "emergency transmission" from a Klingon prison planet - the decoded message was that a Klingon armada of 47 ships had been destroyed. The next day in the simulator room, recruit Kirk was able to casually beat the test (and destroy attacking Klingon enemy ships, while saving the Kobayashi Maru crew) - to Spock's ire. He was brought before a board of official inquiry headed by Admiral Richard Barnett (Tyler Perry), facing expulsion. He was accused of cheating by entering a subroutine into the computer simulation. When Kirk faced his accuser, Spock, they debated the no-win scenario, which Spock argued was necessary and the test's principal lesson: "The purpose is to experience fear, fear in the face of certain death. To accept that fear, and maintain control of oneself and one's crew." Before the hearing concluded, the Federation was informed of a distress call from Vulcan, and with the primary fleet away in another space system, all cadets were ordered to report to the space hangar, where they were assigned to various ships for rescue missions. McCoy smuggled the academically-suspended and grounded Kirk aboard the recently-commissioned USS Enterprise citing medical reasons -- Uhura was also reassigned to the same ship by Spock, her secret lover. The first sight of the USS Enterprise, to be commanded by Captain Pike, was spectacular as the shuttle reached the space dock. 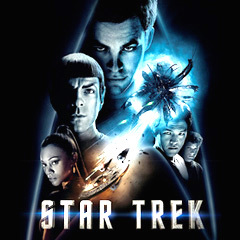 Other crew members onboard included pilot/helmsman Hikaru Sulu (John Cho), and Russian-accented Pavel Chekov (Anton Yelchin) - and the ship was directed at warp speed toward Vulcan, which in its distress call had reported natural disasters including a "lightning storm" and seismic activity. As they approached Vulcan's upper atmosphere and were preparing to help evacuate it, Kirk (suffering from a vaccine reaction with swollen hands) realized that the Vulcan report sounded eerily like the one facing the USS Kelvin years earlier - he feared: "We're flying into a trap." He first confronted Uhura about the Klingon emergency call that she had deciphered earlier, and confirmed that the attackers of the 47 Klingon warbirds were Romulan. He then warned Captain Pike that Vulcan was being attacked by Romulans, and that their ship was facing a Romulan trap -- a logical theory also confirmed by Spock. Seven Federation fleet ships already having arrived at Vulcan had been destroyed by Nero's massive ship the Narada - the reason for a debris field in space. Nero's plan was to drill through Vulcan's atmosphere and into her crust with a drilling beam (a "high-energy pulse device") designed to reach the planet's core, artificially create a black hole within it (by launching "red matter" into it), and then destroy it. When the USS Enterprise arrived at Vulcan, it had to navigate through the debris field of the decimated fleet. When Nero saw the new ship arriving, he ordered it to also be torpedoed (causing partial damage), but when he saw that it was the Enterprise, he quickly ordered a cease-fire, and hailed Captain Pike. Nero identified himself as a rebel Romulan ("We stand apart"), greeted confused Vulcan crew member Spock, and then ordered Pike to be transported via shuttle (as Lieut. Kirk had been ordered) to the Narada for negotiations. As Pike departed for Shuttle 37 for transport, Spock remained to captain the Enterprise, and Kirk was promoted to First Officer. Three crew members trained in advanced hand-to-hand combat were selected (Sulu, Kirk, and Engineer Olson) to "space-jump" from the shuttle. Their orbital skydive propelled them to the Narada's drilling platform, deployed into the Vulcan atmosphere, where they disabled and destroyed it, and prevented it from further disrupting transporter operation and communications. During the risky maneuver, Olson lost his life (by waiting too long to deploy his parachute), and after an intense struggle, Sulu and Kirk sabotaged and incapacitated the drill. However, Nero had already successfully drilled to the Vulcan planet's core, and launched the "red matter" - to create a black hole that began the planet's disintegration and implosion into oblivion. Checkov saved Sulu and Kirk after their mission and beamed them back aboard the Enterprise. Spock also beamed himself down onto Vulcan to save a few elderly members of the Vulcan High Council, but was unable to save his mother, and well as most of the planet's population. Spock wrote in the log: "Acting Captain's Log, Stardate 2258.42. We have had no word from Captain Pike. I therefore classified him a hostage of the war criminal known as Nero. Nero, who has destroyed my home planet and most of its six billion inhabitants. While the essence of our culture has been saved in the elders who now reside upon this ship, I estimate no more than 10,000 have survived. I am now a member of an endangered species." Uhura noticed the effect upon Spock, and joined him in a paused turbolift elevator, where she secretly assured him of her love with embraces and kisses ("I'm so sorry"). His only limited response to her was needing everyone to continue to perform "admirably." On board the Narada bound for the next target - Earth, hostage Capt. Pike accused Nero of genocide, while Nero demanded security codes that surrounded and defended Earth (using the torture method of putting a Centaurian slug in Pike's throat to force out the information). A confused Nero then explained the reasons for his 25 years of mad retributive revenge against the Federation: his pregnant wife was killed during the destruction of Romulus, while the Federation did nothing. He also blamed (wrongly) the deaths on Spock's betrayal. Although Pike insisted that Romulus still existed, Nero only knew about the destruction of a future Romulus, and wouldn't believe him. Meanwhile, back on the Enterprise, Spock determined that Nero had created "a tunnel through space-time" and had come back from the future, bringing with him advanced "black hole" technology. Although Spock wanted to rendezvous with the Starfleet Federation, Kirk demanded immediate action against Nero, or otherwise it would be too late: "What we need to do is catch up to that ship, disable it, take it over, and get Pike back." Kirk also argued that they must be unpredictable: "The logical thing is to be unpredictable," although Spock asserted that Nero's arrival from the future had already altered the course of history, disrupted the time continuum, and changed everyone's destiny: "Nero's very presence has altered the flow of history, beginning with the attack on the USS Kelvin, culminating in the events of today, thereby creating an entire new chain of incidents that cannot be anticipated by either party." Uhura added: "An alternate reality." After further argument, Spock ordered Kirk (after pinching his nerve and neutralizing him) off the ship, on charges of mutiny, to be ejected in a space pod and marooned on the icy, snow-covered Vulcan planet of Delta Vega. After crash-landing and although daring and unsafe, Kirk decided to hike to the nearest Starfleet station fourteen kilometers away to the northwest. He was chased by two voracious, threatening animals: a "polarilla" with sharp teeth and another larger insectoid creature with a tendril mouth. In one of the planet's caves, he was rescued from being consumed by an elderly man with a flaming torch - the man revealed himself to be Ambassador Spock, Spock's future self, to Kirk's astonishment. Kirk asserted that Acting Captain Spock, in command of the Enterprise, had ejected him from the ship and marooned him there for mutiny, and therefore wasn't his friend. He also told Spock that Pike had been taken hostage by a "particularly troubled" Nero - the one who was responsible for all the troubling events of recent time. Through a time-saving mind-meld transference, Spock told his story about how he was from the future. In the year 2387, an all-consuming supernova from a star threatened to destroy the planet Romulus, and Spock was on a mission to prevent the impending disaster. Spock stock-piled "red matter" (a substance capable of forming singularity, a black hole) to be used to absorb the exploding supernova, but in the process of traveling enroute to Romulus in his spaceship, the supernova abruptly exploded and destroyed the planet. One of the only surviving Romulan spaceships was Captain Nero's mining vessel the Narada - it attempted to intercept Spock, when both Spock's spaceship and Nero's Narada were sucked into the black hole and sent back in time into the past. The Narada arrived first, 150 years in the past, where it confronted and destroyed the USS Kelvin. Spock's ship also arrived in the past only a few seconds later, but it was actually 25 years later - where he was intercepted by the awaiting Nero who sought revenge: "He held me responsible for the loss of his world." Spock and his vessel were captured and he was marooned on Delta Vega, so that he could helplessly watch his home planet Vulcan's destruction ("so that I would know his pain"). Kirk understood that in going back in time, Spock had changed their lives, and was responsible for the deaths of billions of others. History had been altered and they were living in an alternate reality. In the original timeline scenario, Kirk learned from Spock that he had spoken about how his father was his inspiration for joining Starfleet, and the elder Kirk had proudly seen his son become Captain of the Enterprise. The two decided to walk to the nearby Starfleet outpost, where they were first met by a short alien assistant, who introduced them to Montgomery "Scotty" Scott (Simon Pegg), a transporter expert who would soon 'discover' the equation for trans-warp beaming (through Spock's help). He explained how he had been exiled onto Delta Vega due to his failed experiment involving an Admiral's dog. Spock insisted that Kirk must emotionally provoke and compromise his younger self, Acting Captain Spock, to invoke a Violation of Regulation 619. This would force Spock to resign, and then Kirk could assume command of the Enterprise in order to stop Nero. Scott and Kirk, with Spock left behind (wishing them "Live long and prosper"), beamed onto the Enterprise, but during the transport, Scotty reappeared inside the ship's main water supply tubing - until he was rescued by Kirk through an emergency release valve. Their intrusion was noted, and they were taken by security personnel to the bridge. There, following Elder Spock's advice, Kirk deliberately enraged commanding Spock (even claiming that he didn't love his mother) - causing an outburst and proving that the acting captain's emotions were compromised by the destruction of Vulcan, and that he must relinquish command to Kirk. Then, Kirk commanded that the Enterprise change course to immediately pursue Nero and the Narada that were heading toward Earth. Crew member Chekov's plan was to drop out of warp and invisibly hide behind Saturn's moon of Titan, and then ambush the Narada. As long as the drill wasn't activated, they could beam aboard the enemy ship. Spock confirmed the viability of Chekov's plan - it would be possible to get on the ship, steal the black hole device, rescue Captain Pike, and save Earth. The Romulan ship the Narada began to deploy and activate its drill over San Francisco (headquarters of Starfleet) near the Golden Gate Bridge (after activation, communications were cut off), while the Enterprise readied itself, as planned, for Kirk and Spock to beam themselves aboard the Narada. As Spock was preparing to leave in the transport area, Uhura lovingly kissed him goodbye and revealed her first name, Nyota, overheard by an astonished Kirk. Kirk and Spock were beamed onboard, where their plan was immediately endangered when they found themselves detected in an occupied part of the enemy ship - and in a firefight. They boarded Elder Spock's spaceship, which recognized the younger Spock as its previous captain. The ship's computer announced that its manufacturing origin was 2387, and it was commissioned by the Vulcan Science Academy. Kirk was assured (and knew) that Spock could fly the vessel, and that their plan would succeed. Spock commanded Elder Spock's ship out of the Narada on a mission to destroy the drill, while Kirk went to rescue Captain Pike. Kirk met Nero face-to-face, when Nero foretold that history was now changed, and that Kirk would die like his father on the Kelvin. However, news of Spock's successful destruction of the drill diverted Nero's attention, and Kirk was able to kill Ayel, Nero's first officer, with a point-blank blast from a pistol. At the same time, Spock and Nero taunted each other, and Spock's ship, traveling at warp speed, was able to lure the Narada away from Earth in fast pursuit. But then Spock turned his ship around and piloted a collision course toward the Narada to ram into it - as the Enterprise arrived and provided further firepower to protect Spock. (Meanwhile, inside the Narada, Kirk located Captain Pike and rescued him.) From two different target locations, Kirk, Pike, and Spock were beamed into the Enterprise, as Spock's spaceship collided with the Narada and ignited the ship's stockpile of "red matter" - both ships were disintegrating and a black hole was created. As the Narada was sucked into the black hole, Kirk compassionately offered Nero and his crew a chance to be rescued and survive, but Nero refused: "I would rather suffer the end of Romulus a thousand times. I would rather die in agony than accept assistance from you." So Kirk obliged and opened fire. However, the Enterprise found itself also threatened by the immense gravitational pull of the black hole, and only escaped by ejecting the warp core and detonating it near the black hole, causing the explosion to push them away to safety. Space, the final frontier. These are the voyages of the Starship Enterprise. Her ongoing mission, to explore strange new worlds, to seek out new life-forms and new civilizations, to boldly go where no one has gone before. The eleventh film of the entire series - a relaunch or reboot, featuring the main characters (but portrayed by new cast members) of the original Star Trek series. A prequel to the Original Crew series. The next film in the series was Star Trek Into Darkness (2013), directed again by J.J. Abrams. It reprised Chris Pine as James T. Kirk, captain of the USS Enterprise in the 23rd century, and Zachary Quinto as Mr. Spock. The mission of Kirk and his crew was a manhunt to capture terrorist mastermind John Harrison (Benedict Cumberpatch). With a production budget of $150 million, with box-office gross receipts of about $257.7 million (domestic) and $385.7 million (worldwide). This film was nominated for four technical Academy Award nominations (including Best Sound Editing, Best Sound Mixing, and Best Visual Effects), and it won, predictably, for Best Makeup. It was denied a spot in the enlarged Best Picture category of 10 films. With its single Best Makeup win, it became the first Academy Award-winner in the history of the entire Star Trek series. This was the highest-grossing Trek film, surpassing the previous leader Star Trek IV: The Voyage Home (1986) at about $110 million (domestic), and ultimately above both Star Trek Into Darkness (2013) at $228.8 million (domestic), and Star Trek Beyond (2016) at $158.9 million (domestic). It also had the largest opening for a Star Trek film at $75 million, beating the previous record holder Star Trek: First Contact (1996) at $31 million.